Another Sunday in January will once again be packed with loads of football fun. 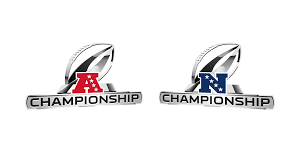 On Jan. 20, the New England Patriots will visit the top-seeded Kansas City Chiefs at 6:40 for the AFC Championship, after the New Orleans Saints and the Los Angeles Rams square off for the NFC title game at 3:05. MVP frontrunner Patrick Mahomes will hope to lead Kansas City to their first Super Bowl appearance since 1969, when they defeated the Minnesota Vikings 23-7 for their only championship victory. The Patriots will ride on the back of Tom Brady and running back Sony Michel, who both have put together very good seasons. The Patriots will continue facing the challenge of losing standout wide receiver Josh Gordon after violation of his reinstatement terms, but have many players all around the grid who are ready to step up. The Chiefs also are still dealing with the loss of star running back Kareem Hunt, who was released by Kansas City after a video surfaced of him assaulting another woman last Feb. The Patriots beat the Chiefs in their regular season battle in a down to the wire 43-40 victory in New England, where Brady piled up 340 passing yards on the night. On the other spectrum, the Rams dropped their regular season matchup to the Saints 45-35, ending the undefeated Rams streak. Led by MVP candidate and veteran quarterback Drew Brees, the Saints’ heavy-powered offense is driven by back Alvin Kamara and receivers such as Michael Thomas and Dez Bryant. The Saints compiled a 13-3 record and are a very tough team to beat at home in the Mercedes Benz Dome. Stud running back Todd Gurley and his Rams are ready to end their Super Bowl drought ever since quarterback Kurt Warner’s 2001 team fell on a last second field goal to the New England Patriots, giving the latter team its first Super Bowl victory. The Rams powerful offense has defeated teams all year, and their defense has held their own behind the likes of defensive mastermind Aaron Donald. Both games are expected to be hard fought and physical, and any team could come out as winners. It is exciting to see new faces like Kansas City, Los Angeles, and New Orleans, who have had a combined two Super Bowl appearances this decade, next to New England which holds five Super Bowl rings along with eight appearances since 2001.